Reactions to the Miers Withdrawal News that Harriet Miers is withdrawing from consideration for a Supreme Court appointment produced varying reactions. There was relief that the controversy over her nomination is over. There were also calls for President Bush to come up with a replacement who will have more of a legal track record. 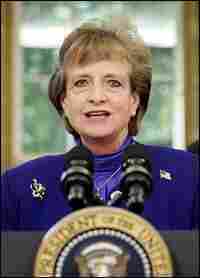 Harriet Miers is President Bush's nominee to replace Sandra Day O'Connor on the Supreme Court. Harriet Miers, in her withdrawal letter to President Bush: "I have been greatly honored and humbled by the confidence that you have shown in me, and have appreciated immensely your support and the support of many others. However, I am concerned that the confirmation process presents a burden for the White House and our staff that is not in the best interest of the country." President Bush: "It is clear that senators would not be satisfied until they gained access to internal documents concerning advice provided during her tenure at the White House -- disclosures that would undermine a president's ability to receive candid counsel. Harriet Miers' decision demonstrates her deep respect for this essential aspect of the constitutional separation of powers -- and confirms my deep respect and admiration for her." Senate Judiciary Chairman Arlen Specter (R-PA) says Miers has been treated in a "really disgraceful" manner. Sen. Minority Leader Harry Reid (D-NV) says Bush shouldn't reward "the bad behaviour of his right-wing base" in the next nomination. Sen. Charles Schumer (D-NY) urges Bush to select a nominee that "unites not divides us." David Frum, a former speechwriter for President Bush, says Miers hearings would have torn the Republican Party apart. Sen. Sam Brownback (R-KS) says Miers faced insurmountable problems. Ralph Neas, president of People for the American Way, a liberal public advocacy group, says Bush surrendered to pressure from conservatives. Sen. Richard Durbin (D-IL) says he hopes the next nominee reflects "mainstream values." Senate Minority Leader Harry Reid (D-NV): "The radical right wing of the Republican Party killed the Harriet Miers nomination. Apparently, Ms. Miers did not satisfy those who want to pack the Supreme Court with rigid ideologues... In choosing a replacement for Ms. Miers, President Bush should not reward the bad behavior of his right wing base. He should reject the demands of a few extremists and choose a justice who will protect the constitutional rights of all Americans." Sen. Charles Schumer (NY), ranking Democrat on the Senate Judiciary Committee: "Harriet Miers is a fine and capable person, but that was clearly the wrong position for her. Her gracious withdrawal saves Harriet Miers and the nation from a difficult and agonizing process and decision. There is now one clear path for the president: to choose a knowledgeable and mainstream successor in the mold of Sandra Day O'Connor." Sen. Arlen Specter (R-PA), chairman of the Judiciary Committee: I'm sorry to hear that Miss Miers has decided to remove her name from consideration. I think that this is a sad episode in the history of Washington, D.C. ... The way Harriet Miers has been treated is really disgraceful. Sen. Sam Brownback (R-KS): "Any nominee, particularly to the Supreme Court, faces a hill to climb and this one just kept growing… The Senate was just not willing to give its advice and consent blindly on a position of such importance to the future of the country." Sen. Orrin Hatch (R-UT), a member of the Senate Judiciary Committee: "I'm sorry it came to this. The Senate has the constitutional duty to evaluate whomever President Bush will nominate to replace Justice O'Connor. When we do, politics must not undermine the principles and standards we apply to every judicial nomination. I believe President Bush will keep his promise to appoint a justice who will interpret the law but not legislate from the bench." Sen. Patrick Leahy (VT), ranking Democrat on the Senate Judiciary Committee: "I look forward to consulting with the President on his third nominee to succeed Sandra Day O'Connor on the Supreme Court, and I hope it is a decision he approaches with the necessary independence from partisan factions." David Frum, resident fellow at the American Enterprise Institute and a former speechwriter for President Bush: Senate hearings for Miers "would have just torn the [Republican] Party apart on national television. It's clear… Harriet Miers was not the person the president thought she was and more and more Republicans were going to wake up to that and it would have unleashed a lot of turmoil inside the party." Ralph Neas, president of People for the American Way, a liberal public advocacy group: "This is an astonishing spectacle. I'm not sure in my 30 years of working on Supreme Court nominations I've ever seen a more total and abject capitulation by a United States president to the far right of his party. This is a complete surrender, and I think it demonstrates the ultra-right wing dominance of Republican Party politics is total."